The origin of this firm goes back to 1862 when Spanish immigrant from Mallorca Pedro Antonio Llinás Bisbal (1837-1875) arrived in Puerto Rico, two years later he had already established a store in Barrio Guayo of Adjuntas. In 1874 his nephew Gabriel Llinás Oliver (1861-1926) arrived on the island to help in his uncle's business. Pedro died single with no children leaving ⅔ of his inheritance which included the store and the land surrounding it to his mother Francisca Bisbal who lived in Mallorca at the time, and ⅓ to his nephew Gabriel. Upon his arrival in Puerto Rico and despite his young age, Pedro got his nephew a job at Suau, Frau & Co. in Ponce so he could start learning the coffee business. After his uncle's death, in 1878 Gabriel established the partnership G. Bernat & Cia. together with his grandmother Francisca and his brother-in-law and 1st cousin Guillermo Bernat Oliver (1852-1922) who had lived in Adjuntas since 1864 and was married to his sister Francisca Llinás Oliver. Guillermo was general partner and Gabriel and Francisca were limited partners due to his young age and her residence in Spain. The assets left by Pedro Llinás Bisbal, which included Hacienda San Pedro in Barrio Guayo of Adjuntas, then passed on to the partnership. 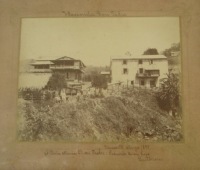 In 1893 the partneship acquired the farm "El Cercado" in Yauco from Pedro Maestracci and established a mercantile and coffee processing operation at the building pictured below, then located in the outskirts of the city of Yauco on the road to Lares & Maricao where many of the coffee haciendas were located. The ground level was used as office and warehouse and the upper level as residence where Gabriel, who in 1886 had married his cousin Francisca Arbona Oliver, moved with their children Jorge (1888), Catalina (1892) and later Gabriel (1896) and Providencia (1899). Between 1905 and 1908 a two story machine house which included a "Tahona" or mill was built behind the warehouse to process coffee grown at their different haciendas and bought from other growers. With this integration, G Bernat & Co. became one of the major coffee exporters on the island. Between 1897 and 1909 the parnership agreement was ammended first due to the passing of Francisca and a second time due to the passing of her only surviving son Jorge Llinás Bisbal to whom she had bequeathed all her inheritance. The heirs of Jorge Llinás Bisbal were Gabriel Llinás Oliver, who as stated above had lived in Puerto Rico since 1874, and his younger brother Jorge Llinás Oliver (1868-1920) who had arrived in Puerto Rico in 1886. In 1909, Guillermo Bernat Oliver decides to retire and return to Spain. As a result, the firm G. Bernat & Cia. is dissolved and all its assets which consisted among others of some 509 acres of land in Adjuntas, Guayanilla and Yauco, were transfered to the new partnership Sucrs. de G. Bernat & Cia. which operated until 1913 when G. Llinás & Cia. was established to take over all its assets which at the time exceeded 1,000 acres and all its operations. The members of G. Llinás & Cia. were brothers Gabriel and Jorge Llinás Oliver and also Spanish immigrant from Mallorca Jaime Castañer Garau (1871-1959) who had worked at the firm since 1890 running the firm's agricultural operation (Castañer Garau was not related to the owners of Hacienda Castañer ). Subsequently Antonio Oliver Delgado (1886-1922) who was born in Lares of Mallorcan father and Venezuelan of Canary Island descent mother, was added as general partner. Antonio had married Catalina Llinás Arbona in 1911, the daughter of Gabriel Llinás Oliver. During the early years of G. Llinás & Cia., Jorge Llinás Oliver became ill and returned to Spain and Gabriel Llinás Oliver retired in Spain. As a result, a second family generation represented by Antonio Oliver Delgado took charge of the business together with Jaime Castañer Garau. However, in 1918 Antonio contracted Tropical Sprue and returned to Spain forcing Gabriel to return to the island. In a 1918 report to the US Congress prepared by the Government of PR listing all real estate holdings in excess of 500 acres used for agricultural purposes and held directly or indirectly by corporations, partnerships or individuals, G. Llinás & Cia. is listed with Guillermo Bernat Oliver, Gabriel Llinás Oliver, Jorge Llinás Oliver, Jaime Castañer Garau and Antonio Oliver Delgado as members owning land in the municipalities of Adjuntas, Yauco, Lares, Maricao and Utuado. During the WWI years when many farmers lost their plantations to creditors, G. Llinás & Co. acquired several coffee haciendas. The effects of Hurricane San Felipe of 1928 were devastating for the coffee industry and G. llinás & Cia. was no exception. Although as creditors of many farmers the firm acquired a number of coffee farms in foreclosure or in lieu of payment of crop financing loans, these farms needed a big amount of capital investment to bring them back to a productive stage requiring substantial amounts of capital. Hacienda San Pedro - Located at Barrio Guayo in Adjuntas, was the first 60 acres acquired by Pedro Antonio Llinás Bisbal which grew to around 600 acres in 1912. Was sold in 1936 in order to satisfy bank debt acquired to come back from the effects of the 1928 hurricane, the hacienda's manor house became what the first hospital built by ythe Menonites know as "el hospital viejo" in the township of Castañer. Hacienda San Andrés - Located in Adjuntas, it extended from "Cerro Guilarte" almost to Lake Garzas, was formed prior to 1913 with lands owned by Pedro Antonio Llinás Bisbal and Guillermo Bernat Oliver. Besides coffee, the fruit known as Cidra (citrus medica) was grown here and exported to Europe wher it had a great demand. Hacienda Delfina - Was in reality over 900 acres formed by four adjoining coffee farms acquired in lieu of payment of crop loans: La Vega renamed Iberia upon acquisition (212 acres), Collado (111 acres), Delfina (600 acres) and San Elías. It is still owned by family member Guillermo Oliver Prefasi. Rio Prieto - Comprised of 180 acres located part in Yauco and part in Maricao, acquired in lieu of payment of crop loans. Hacienda Massini - 96 acres Located in Barrio Veguitas of Jayuya, acquired in 1939. Haciendas Santoni & Buena Vista - Approximately 100 acres in Barrio Tabonuco of Sabana Grande. Hacienda La Eugenia - Approximately 40 acres in Maricao. Hacienda La Josefa - Approximately 207 acres in Maricao, was acquired in 1938 an was deeded to Jaime Castañer Garau in payment of his participation in G. Llinás & Cia. when the firm was liquidated. Hacienda La Candelaria - Consisted of 295 acres in Barrio Frailes of Yauco acquired in 1929 in liueu of crop payment. Hacienda Mogotes - Approximately 544 acres in Barrio Rodadero of Yauco known for the excellent quality of its coffee, acquired in 1938 from the Pieraldi family. Hacienda Agustinillo - Located in Barrio Collores of Juana Diaz, consisted of 181 acres dedicated to grow sugarcane and later a cattle farm. Hacienda Mattei - Approximately 158 acres in Barrio Aguas Blancas of Yauco. Las Caños, Bayaney & Valencia - Three farms in the Arecibo region dedicated to grow sugarcane. Its administrator was Luis Ledesma Oliver, a cousin of Salvador Oliver Llinás, who was related to Central Bayaney . El Cercado - Was approximately 12 acres where the facilities pictured below were located. With the passing of Jorge Llinás Oliver, the untimely death of Antonio Oliver Delgado and the passing of Gabriel Llinás Oliver in 1920, 1922 and 1927 respectively, the firm remained in the hands of Jaime Castañer Garau. The 3rd Llinás generation to handle the business affairs after Gabriel's death was led by Jorge Llinás Oliver sons Jorge Llinás Morell (1906-1985) and José Llinás Morell and Salvador Oliver Llinás (1912-2000), eldest granson of Gabriel Llinás Oliver, the last 2 who joined the firm in 1930 and 1931 respectively. The contribution of the new generation and their close business relationship with Banco de Ponce, of which Jorge Llinás Morell was a Board Member, proved very valuable in providing the financial resources necessary recover from the devastation of the 1928 hurricane. With the effects of the hurricane behind, the firm continued their land acquisition program into the late 1930s and later on, with the coffee in decline, G. Llinás & Co. expanded its operations to Tobacco, Corn, Cocoa and Sugar. In 1950 Jaime Castañer Garau retired from the firm and in payment of his participation he received Hacienda La Josefa. In the 1960s G. Llinás & Co. began disposing of its assets including the coffee processing equipment which was sold to the Atienza family owners of Hacienda San Pedro . To liquidate the shares of the firm members that resided in Spain, a number of farms and other properties were sold. The firm was finally dissolved in the 1990s. Hacienda Desideria still remains in family ownership. The pictures below obtained from the Puerto Rico State Historic Preservation Office are part of a 1987 study made by Archeologist Luis Pumarada O'Neill. The structure that used to be the office and residence is now a museum and library owned and maintained by the Municipality of Yauco. The structure that used to be the warehouse had to be demolished due to damage caused by Hurricane Hortense of 1996. Some of the pictures in the first gallery below and most of the above history was provided to us by Antonio J. Oliver Prefasi, great grandson of Antonio Oliver Delgado and of Gabriel Llinás Oliver, to whom we thank for his contribution and generosity in sharing such valuable information.